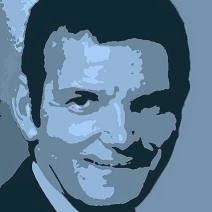 Peter Martin: Budget be damned. Why rates are going up regardless. Budget be damned. Why rates are going up regardless. The Reserve Bank will raise interest rates weeks after the budget regardless of its content. Taking advantage of the traditional release of its own economic forecasts on the Friday before the budget the Bank said unless it acted swiftly inflation would climb to the top of its target band and sail beyond it. It has held its cash rate steady at 4.75 per cent since Melbourne Cup Day 2010. An increase of 0.25 per cent would push the variable mortgage rates charged by Westpac, the Commonwealth and ANZ banks above 8 per cent. It would add around $50 to the monthly cost of servicing a $300,000 loan. The next opportunity for the Bank to move is on June 7 at its next Board meeting four weeks after Tuesday’s budget. It’s made plain that the increase would be the first of several. 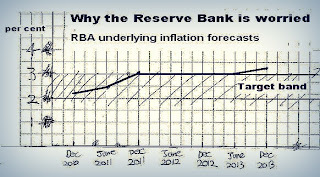 Financial markets had already pencilled in two Reserve Bank increases, in early 2012 and mid 2013. Signalling it would not be dissuaded by negative economic growth in the March quarter national accounts to be released on June 1 the Bank said it would “look through the volatility in inflation and economic activity as a result of the natural disasters during the summer”. It would set rates “to ensure a continuation of the low and stable inflation that has made an important contribution to Australia’s strong economic performance over the past two decades”. The bank expects inflation to accelerate as wages climb in response to falling unemployment and is concerned mining companies will “compete aggressively for labour” pressuring wages further. It expects economic growth to accelerate to a blistering 4.25 per cent by year’s end, easing to 3.75 per cent by December 2013 as the high Australian dollar eats into the profitablity of non-mining companies. Also driving inflation will be higher utilities charges (especially electricity) and rents with a more stable Aussie Dollar no longer holding back import prices. The dollar surged on the Reserve Bank’s statement climbing half a cent to 107 US cents despite falling international commodity prices. Economists from Westpac, Nomura, HSBC, Deutche Bank and the ANZ all switched their forecasts to a June rate hike followed by more as needed to caintain inflation. The Commonwealth Bank thought a June hike was likely. Westpac chief executive Gail Kelly said on Wednesday Australians would not be able to handle more than one rate hike for the remainder of the year. National Australia Bank chief Cameron Clyne said further rate rises were inevitable. Treasurer Wayne Swan warned against “jumping to conclusions about future decisions” on the basis of what the Reserve Bak said. 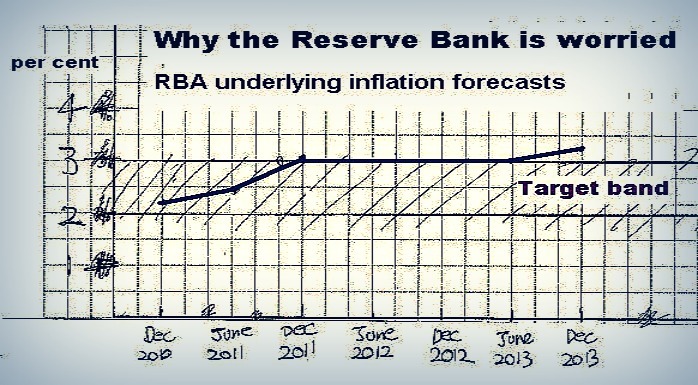 “The Reserve Bank takes its decisions independently of the government, but the government is playing its role in bringing our Budget back to surplus in 2012-13 and building those surpluses over time to make sure we make room for the investment boom,” he said. Separately yesterday a Senate inquiry rejected calls for Australia Post to go into banking to provide competition in the mortgage market and called for a new commission of inquiry into the financial system.